Place peppers in boiling water, cover, reduce heat and simmer 6 to 8 minutes. Remove peppers and drain upside down on paper towels. Meanwhile in a skillet over medium heat brown ground beef in olive oil. Add onions, and oregano, stirring occasionally. Reduce heat to low and add rice to meat mixture. Add salt and pepper to taste. Add 1 cup spaghetti sauce and allow to simmer 5 minutes. Remove filling from heat. Divide filling between peppers and place stuffed peppers in 9 x 13- inch baking dish. Pour remaining spaghetti sauce over peppers. Top each pepper with mozzarella and bake for 20 to 25 minutes. 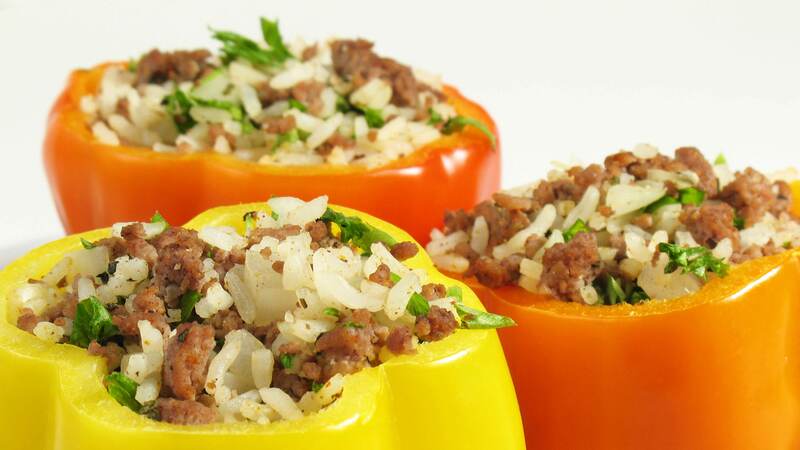 Just before serving, garnish each stuffed pepper with two or three small sprigs of parsley.